Perform any transaction amount like Wing-to-Wing, Wing-Wei-Luy, Outbound Money transfer, Phone Top-Up, Bill Payment and or Cash Out from your Wing Account to get a chance to win on the lucky draw. Valid transaction are: Wing to Wing, Wing –Wei-Luy, Outbound Remittance, Phone Top-up, Bill payment and Cash out. Valid transaction is equal to 1 Lucky Draw entry. The more you transact the more chances of winning. There will be 21 winners on the first draw, 10 winners on the second and 11 winners on the third draw with a total of 42 winners. Lucky draw shall be based on transaction ID and winners shall chose via electronic Lucky draw. Live draw shall be announced on the Facebook only. Winner’s photo will be taken and shall be posted on wing’s Facebook page. Wing is not owner of the prizes, separate term and conditions of quality and warranty apply. When do the promotion start? a. The promotion starts from 20 November 2018 until 28 February 2019. How can I join the lucky draw? a. Perform any transactions amount such as: Wing-to-Wing, Wing-Wei-Luy, Outbound remittance, Cash Out, Phone Top-Up, or Bill Payment. 1 Valid transaction is equal to 1 lucky draw entry, the more you transact the more chance of winning you will get. How many prizes per lucky draw? What are they? How can I know I have won the lucky draw prize? How can I claim the lucky draw prize? a. 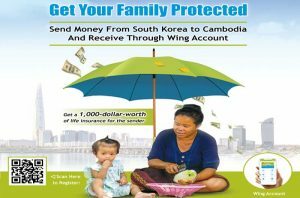 Wing will provide the Coupon to the Winners and inform to G GEAR the List of winners. The Winner shall bring with the coupon, National ID card and Wing card to verify and claimed the prize at LG Retail Store. Can I perform others transaction in order to join the lucky draw? For payment of the utility bill below 25$, can I eligible to join the Lucky draw?